Show Date: Apr 24, 2019 7:30 p.m. Apr 25, 2019 7:30 p.m. Apr 30, 2019 7:30 p.m. May 01, 2019 7:30 p.m. May 06, 2019 7:30 p.m. May 07, 2019 1:00 p.m. May 13, 2019 7:30 p.m. May 14, 2019 7:30 p.m. May 17, 2019 7:30 p.m. May 18, 2019 1:00 p.m. May 18, 2019 7:30 p.m. May 19, 2019 1:00 p.m. May 19, 2019 7:30 p.m. May 21, 2019 7:30 p.m. May 22, 2019 1:00 p.m. May 23, 2019 7:30 p.m. May 24, 2019 7:30 p.m. May 25, 2019 1:00 p.m. May 25, 2019 7:30 p.m. May 27, 2019 7:30 p.m. May 28, 2019 7:30 p.m. May 30, 2019 7:30 p.m. May 31, 2019 7:30 p.m. Jun 01, 2019 7:30 p.m. Jun 06, 2019 7:30 p.m. Jun 07, 2019 7:30 p.m. Jun 08, 2019 7:30 p.m. Jun 13, 2019 1:00 p.m. Jun 13, 2019 7:30 p.m. Jun 14, 2019 7:30 p.m. Jun 15, 2019 7:30 p.m. Jun 17, 2019 7:30 p.m. Jun 18, 2019 7:30 p.m. Jun 20, 2019 7:30 p.m. Jun 21, 2019 7:30 p.m. Jun 22, 2019 7:30 p.m. Jun 25, 2019 7:30 p.m. Jun 28, 2019 7:30 p.m. Jun 29, 2019 7:30 p.m. Jun 30, 2019 7:30 p.m. Jul 01, 2019 7:30 p.m. Jul 02, 2019 7:30 p.m. Jul 04, 2019 7:30 p.m. Jul 05, 2019 7:30 p.m. Jul 06, 2019 7:30 p.m. Jul 08, 2019 7:30 p.m. Jul 09, 2019 7:30 p.m. Jul 11, 2019 7:30 p.m. Jul 12, 2019 7:30 p.m. Jul 13, 2019 7:30 p.m. Jul 15, 2019 7:30 p.m. Jul 16, 2019 7:30 p.m. Jul 18, 2019 7:30 p.m. Jul 19, 2019 7:30 p.m. Jul 20, 2019 7:30 p.m. Jul 22, 2019 7:30 p.m. Jul 23, 2019 7:30 p.m. Jul 25, 2019 7:30 p.m. Jul 26, 2019 7:30 p.m. Jul 27, 2019 7:30 p.m. Jul 29, 2019 7:30 p.m. Jul 30, 2019 7:30 p.m. Jul 31, 2019 7:30 p.m. Aug 01, 2019 7:30 p.m. Aug 02, 2019 7:30 p.m. Aug 03, 2019 7:30 p.m. Aug 05, 2019 7:30 p.m. Aug 06, 2019 7:30 p.m. Aug 08, 2019 1:00 p.m. Aug 08, 2019 7:30 p.m. Aug 09, 2019 7:30 p.m. Aug 10, 2019 7:30 p.m. Aug 12, 2019 7:30 p.m. Aug 13, 2019 7:30 p.m. Aug 15, 2019 7:30 p.m. Aug 16, 2019 7:30 p.m. Aug 17, 2019 7:30 p.m. Aug 19, 2019 7:30 p.m. Aug 20, 2019 7:30 p.m. Aug 22, 2019 7:30 p.m. Aug 23, 2019 7:30 p.m. Aug 24, 2019 7:30 p.m. Aug 26, 2019 7:30 p.m. Aug 27, 2019 7:30 p.m. Aug 29, 2019 7:30 p.m. Aug 30, 2019 7:30 p.m. Aug 31, 2019 7:30 p.m. Sep 05, 2019 7:30 p.m. Sep 06, 2019 7:30 p.m. Sep 07, 2019 7:30 p.m. Sep 09, 2019 7:30 p.m. Sep 12, 2019 7:30 p.m. Sep 13, 2019 7:30 p.m. Sep 16, 2019 7:30 p.m. Sep 19, 2019 7:30 p.m. Sep 20, 2019 7:30 p.m. Sep 21, 2019 7:30 p.m. Sep 23, 2019 7:30 p.m. Sep 28, 2019 7:30 p.m. Sep 30, 2019 7:30 p.m.
Package includes any combination of tickets up to 2. Experience the mystery and art of illusion with Greg Frewin, International Grand Champion of Magic. Audiences in over 20 countries around the world have been mesmerized by Greg's brilliant performance. Now you can too! 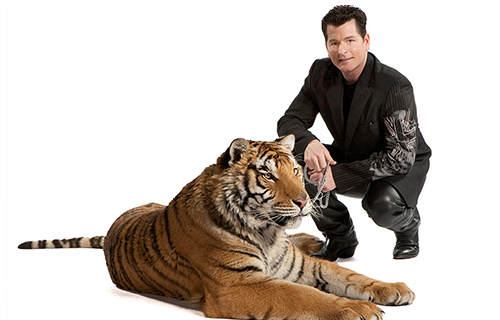 His Las Vegas Style Magical Revue features spectacular appearances by our rare and majestic tigers and exotic birds. Your imagination will be captivated and you will be AMAZED Beyond Belief! After the show, come face to face with one of our stars as we offer the rare and unique opportunity to have your photo taken with a Tiger! - Show dates and times cannot be guaranteed and are subject to availability. Tickets will be allotted by the hotel, at the time of check in and will be valid for a show within the duration of the reservation. Any days where the magic show is not available we will substitute with something of equal value.